For a show about the end of the world, The Last Man on Earth has managed to keep the tone fairly light with the pop culture references flowing. (Considering pop culture ceased to exist.) As Season 2 of the hit FOX series comes to its conclusion, the writers of the show still have at least one great reference left up their sleeves before it all comes to an end for the summer. It seems that the next episode of The Last Man on Earth will give Phil Tandy Miller an opportunity to honor the iconic vehicle from the 1985 classic film Back to the Future in his very own DeLorean. Spoilers await you below, turds. A new clip from the upcoming season finale of The Last Man on Earth recently hit the web, and it shows Tandy (Will Forte) talking to his wife Carol (Kristen Schaal) about going and looking for his brother Mike (Jason Sudeikis), who'd left their refuge in Malibu upon learning that he had contracted the deadly and mysterious virus that wiped out humanity. Tandy has taken it upon himself to go looking for him, and though Carol voices her concern, he ultimately insists that he has to go because he loves his brother – though not before trying to give his unborn child the birds and the bees talk. 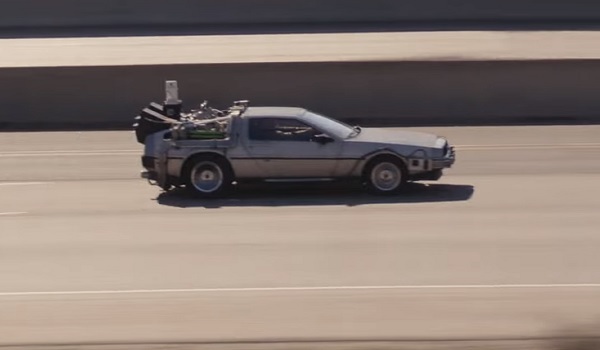 We’d be willing to bet that he’s going 88 miles per hour when he makes it to Tucson. It’s a hilarious moment that fits within the overall tone of The Last Man on Earth, but it also underscores the overall drama of the series, as the overall gravity of the situation ultimately overshadows the cinematic easter egg. The FOX sitcom has slowly become an incredibly somber and heartfelt show over the last season, deftly broaching some serious topics while maintaining its goofy and offbeat sensibilities. Sure, it’s a random reference to a classic movie, but it’s also leading to what could potentially be a heartbreaking moment in Tandy’s life. We will just have to wait and see how this all pans out. Be sure to tune in to The Last Man on Earth this coming Sunday on FOX for the season finale at 9:30 p.m. EST.